It was yet another year of joy and excitement at the Refine MD Holiday Open House event on November 8, 2018. Ladies and gentlemen meandered between demo rooms checking out all that Refine MD has to offer. Demos included popular treatments that Refine MD has provided for years as well as some new state-of-the-art aesthetic skin care treatments now available at the spa. If you missed the event, please continue to read about some of the treatments that were highlighted at the Open House. Dr. Kay Theyerl, Doctor and co-owner of Refine MD, demonstrated how non-invasive facial fillers are an amazing treatment for aging skin. As we get older, our face changes and gravity takes over. Facial fillers can be used to add volume to certain areas of the face, creating a more youthful appearance. In her demonstration, Dr. Theyerl showed how adding Voluma filler to the cheek area lifts up the sagging skin caused by loss of bone. “The filler,” Dr. Theyerl explained, “is a chemical called hyaluronic acid and … is in every one of our cells. And so it is not anything that is foreign to the body.” Voluma Filler is a great option for those that want to add a little lift that provides immediate results. The Thread Lift is a non-surgical procedure that tightens up loose skin. Threads are pulled under the surface of the skin and used to lift and tighten the face. The Thread Lift demonstration was performed by Doctor and co-owner of Refine MD, Dr. Veronica Solis-Rohr. According to Dr. Solis-Rohr, “It is a safe procedure that provides support to the skin and it combines very nicely with filler as well as Botox. Anybody who has some degree of laxity to the skin being triggered by age … can be considered for threading.” This also may be a better alternative for some who are considering plastic surgery. A popular treatment that has been offered for years at Refine MD is Coolsculpting technology by ZELTIQ. Coolsculpting allows Refine MD clients to eliminate or freeze away stubborn fat using a non-surgical method. “The way Coolsculpting works,” explained Dianne Riehl, Refine MD’s licensed medical aesthetician, “is the temperature gets cold enough to actually freeze the fat cells in the area that we are treating — so about 20-25 percent of the fat cells in that area will die from the cold.” Some people who have considered liposuction in the past have turned to Coolsculpting as a non-invasive, fat reducing alternative. 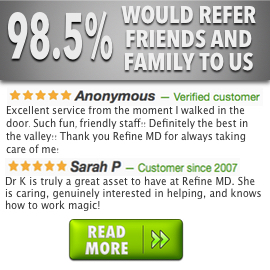 Once again, Refine MD didn’t disappoint as attendees at the open house laughed, mingled, learned, and left with their Refine MD packages of goodies, discounts, prizes, and new Refine Returns memberships. If you couldn’t attend this year, we hope to see you at our next event. Please contact us if you have any questions, or if you want to schedule an appointment for a free consultation. We hope to see you soon!